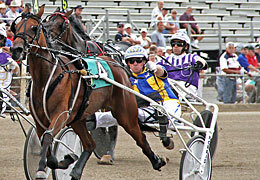 The harness action is in flower, all right, as May kicked off the Meadowlands’ return and the Grand Circuit’s start. We have been putting together some decent, profitable weekends and now we get to pick and choose our plays among the plentiful, keeping powerful trip notes all around. The launching of the Hambletonian Trail blog was successful and we urge you to follow the stakes there, where the pertinent inside information will be posted for the three-year-old colt-and-filly trotters of 2011 headed for the August classics. There is a lot of money to be made in the numerous preps that weekly take place through July. For the early results of how we scored on the initial weekend of the “Trail” journey, go to the blog. Put it on your favorites, along with the Hambletonian Society website, where exclusive results of important Trail races are reviewed. Meanwhile, our big success over the weekend came at a usual haunting ground for us, Cal Expo. We missed hitting the no-takeout Pick 4 but managed to score two winners in one race along with a pair of exactas. Our Pick-4 ticket used Lucky Peterson (16-1) and Itza Free For All (11-1) in the second leg. A dead heat brought both to the winners’ circle, the former paying $17.20 and the latter paying $12.80. The tie hurt the individual prices, of course, but both of those mutuels were still worth it. The exactas with the pair paid $58 and $45.10. In the scheme of things, playing our highest priced horses from our Pick-4 combos has kept us well ahead of the game. We hit one $700-plus Pick 4 so far but we have also chosen horses worth as much as $100 to win in the mix. This is why we prompt you to play individual choices as mentioned in our Pick-4 ticket analyses. At the Meadowlands we were not sharp enough to stay with Bettor Sweet, a pacer we endorsed many times last season. In the Graduate elimination, “Sweet” won strongly over a good free-for-all group at 9-1. Our pair of choices made the final for next week, though. We Will See (fifth) and Lisagain (seventh), will both be in the $246,000 mile May 14, along with Atochia, Won The West, Dial Or Nodial, Hypnotic Blue Chip, Foiled Again, Giddy Up Lucky and Western Shore. That is no walk in the park for Sweet. In the other Meadowlands feature, the “Cutler” prep, Celebrity Hercules was disappointing, even though he was 30-1. Consider that Lucky Jim was eliminated from the start with a break and champion Enough Talk could not hold off challengers in the stretch and you have a situation worth following in this division. Our old friend Corleone Kosmos, for instance, was second in the race at 26-1. And the mare, Buck I St Pat, looked terrible with this group of males, many whom she beat soundly last season. We’ll report on the final in Thursday’s edition. The glamour-boy pacers have hit the track and we will be following them through the 2011 season. At Chester Downs, Pennsylvania Sires Stakes presented a lot of action for the division. In splits worth more than $52,000 each, we were impressed by two colts: Lucky Sniper and All Summer Long. Put On A Show, the champion sophomore pacing filly from last year, won’t be back until at least September, according to trainer Chris Ryder. Ryder said that the late-season opportunities for her were promising, including this year’s Breeders Crown, which we will cover from Woodbine.